If you are an Android fan and think Samsung has enough Galaxy smartphones in their range already, think again because old Sammy has now added a further four smartphones to the Galaxy stable and all of them are Android 2.3 Gingerbread handsets and also a new naming strategy for the Galaxy range. According to an article over on Android Central by way of Korea newswire, the four new Galaxy class smartphones are the Samsung Galaxy W, Samsung Galaxy M Pro, Samsung Galaxy Y and Samsung Galaxy Y Pro. So here’s what the new naming classes are, “S” is for Super Smart and for Samsung flagship devices such as the Samsung Galaxy S — “R” is for Royal/Refined and for premium category devices — “W” is for Wonder for high-quality strategic models — “M” stands for Magical for high-performance devices with an economic price point, and “Y” stand for Young, meaning entry level handsets or strategic models for emerging markets. Then there is also the class indicators…”Pro” that indicated the device has a QWERTY keyboard — “Plus” is an upgrade from an existing version, and “LTE” well that’s self explanatory and means the device is 4G LTE compatible. So what do the new Android smartphones offer, the Samsung Galaxy W has a 3.7-inch touch screen, HSDPA 14.4 mbps connectivity and a 1.4 GHz processor. The Samsung Galaxy M Pro although not much detail spec wise does sport a QWERTY keyboard as the class indicator stipulates, a touch screen although no word on size and a sleek 9.97mm body. When it comes to the Samsung Galaxy Y, again not much detail on actual specs but apparently has a 832 MHz processor, TouchWiz user interface, SWYPE and is apparently targeted towards the younger customer. 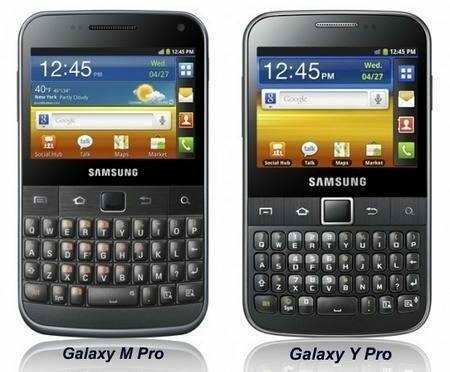 Lastly there is the Samsung Galaxy Pro, once again very light on actual specs but as it is a “Pro” will sport a QWERTY keyboard and optimised for “young professionals”, and has ThinkFree mobile office that offers a range of Office docs such as Word, PDF, Excel and PPT. There’s currently no word on which markets may get the new Galaxy devices or how much any of them will hit you pocket for, but as and when we hear more we will of course pass it along.